Bizarro! "Escher's Pub" is a Framed Limited Edition Hand Signed by creator Dan Piraro; Numbered with COA. Bizarro! 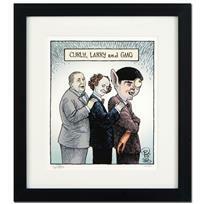 "Three Stooges GMO" is a Framed Limited Edition Hand Signed by creator Dan Piraro; Numbered with COA. Bizarro! 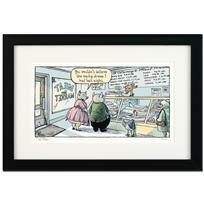 "Christmas Honesty" is a Framed Limited Edition Hand Signed by creator Dan Piraro; Numbered with COA. Bizarro! "Meat Market" is a Framed Limited Edition Hand Signed by creator Dan Piraro; Numbered with COA. Bizarro! 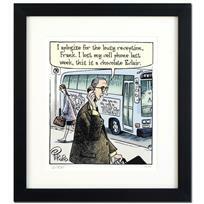 "Eclair Cell Phone" is a Framed Limited Edition Hand Signed by creator Dan Piraro; Numbered with COA. Bizarro! 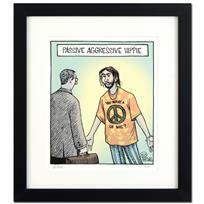 "Passive Agressive Hippie" is a Framed Limited Edition Hand Signed by creator Dan Piraro; Numbered with COA. Bizarro! 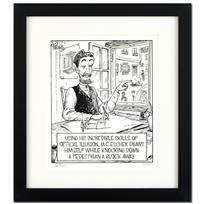 "Stocking Stuffer" is a Framed Limited Edition Hand Signed by creator Dan Piraro; Numbered with COA. Bizarro! 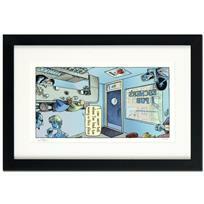 "Hospital Playoffs" is a Framed Limited Edition Hand Signed by creator Dan Piraro; Numbered with COA. Bizarro! 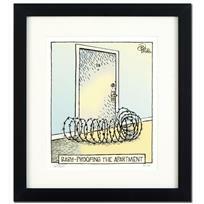 "Baby Proof" is a Framed Limited Edition Hand Signed by creator Dan Piraro; Numbered with COA. Bizarro! "Go West Young Man" is a Framed Limited Edition Hand Signed by creator Dan Piraro; Numbered with COA. Bizarro! 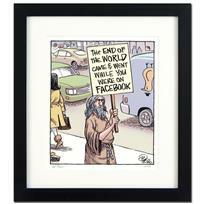 "Facebook Prophet" is a Framed Limited Edition Hand Signed by creator Dan Piraro; Numbered with COA. Bizarro! 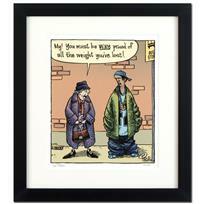 "Baggy Pants" is a Framed Limited Edition Hand Signed by creator Dan Piraro; Numbered with COA. Bizarro! 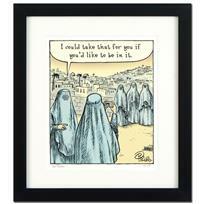 "Burqa Photo Op" is a Framed Limited Edition Hand Signed by creator Dan Piraro; Numbered with COA. Bizarro! "Escher" is a Framed Limited Edition Hand Signed by creator Dan Piraro; Numbered with COA. Bizarro! 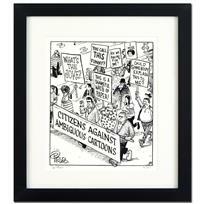 "March Against Ambiguity" is a Framed Limited Edition Hand Signed by creator Dan Piraro; Numbered with COA. Bizarro! "Beauty Contest" is a Framed Limited Edition Hand Signed by creator Dan Piraro; Numbered with COA. Bizarro! 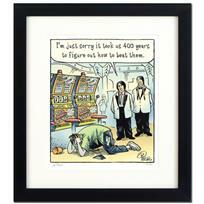 "Casino Indians" is a Framed Limited Edition Hand Signed by creator Dan Piraro; Numbered with COA. Bizarro! 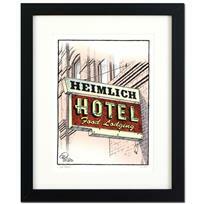 "Heimlich Hotel" is a Framed Limited Edition Hand Signed by creator Dan Piraro; Numbered with COA. Bizarro! 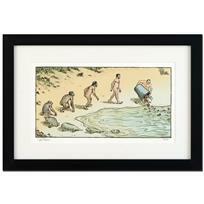 "Evolution Trash" is a Framed Limited Edition Hand Signed by creator Dan Piraro; Numbered with COA. Bizarro! "Inside Liberty" is a Framed Limited Edition Hand Signed by creator Dan Piraro; Numbered with COA.